The ARRL September VHF Contest Has Room for Everyone! The FCC has adjusted very slightly downward -- to $21.40 -- its proposed Amateur Service vanity call sign regulatory fee for Fiscal Year 2014. In a June Notice of Proposed Rule Making (NPRM), the Commission said it intended to hike the current $16.10 vanity fee to $21.60 for the 10-year license term. The FCC released a Report and Order and Further Notice of Proposed Rulemaking (R&O) in the proceeding on August 29, in which it recalculated the fee to $21.40 for the 10-year license term. The $5.30 increase still represents the largest vanity fee hike in many years. The new $21.40 fee does not go into effect until 30 days after the R&O is published in The Federal Register. 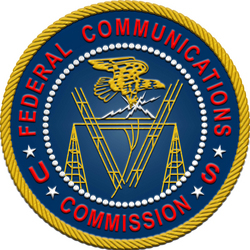 In the R&O, the FCC said it considered eliminating the regulatory fee for Amateur Radio vanity call sign applications and for other services but decided not to do so "at this time," because it lacks "adequate support to determine whether the cost of recovery and burden on small entities outweighs the collected revenue; or whether eliminating the fee would adversely affect the licensing process." The Commission said it would reevaluate this issue in the future to determine if it should eliminate other fee categories. The FCC's Office of Managing Director sets the actual fee vanity call sign fee, based on Wireless Telecommunications Bureau projections of new applications and renewals, taking into consideration existing Commission licensee databases, such as the Universal Licensing System (ULS) database. ARRL's "Red Badgers" will be out in force on Sunday, September 21 UTC (starting the evening of Saturday, September 20, in US time zones), offering another opportunity to snag some high-value contacts to boost your ARRL Centennial QSO Party total. During the second "Red Badges on the Air" activity, ARRL officers, elected officials -- such as Director or Section Manager -- Headquarters staffers and volunteers, and other members of the ARRL family who merit red ARRL name/call sign badges will take to the air. Contacts with red badge wearers are worth a lot of points -- as much as 300 points per contact for working ARRL President Kay Craigie, N3KN -- so participants can increase their Centennial QSO Party tallies very quickly. ARRL Membership and Volunteer Programs Manager Dave Patton, NN1N, said that ARRL red badge holders number about 200 -- including officers, Directors, Section Managers, and Headquarters staff, many of whom will be on the air on September 21. 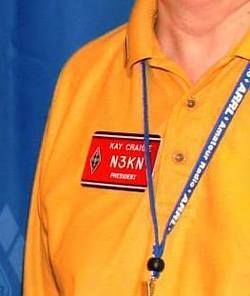 Working this Red Badge wearer -- ARRL President Kay Craigie, N3KN -- is worth 300 Centennial QSO Party points. "Not just Red Badgers will be active, but many ARRL appointees, VEs, and members will be as well," said Patton. "The first Red Badge Day on June 1 was a huge success but left many operators wanting more. Nine months into ARRL's Centennial year, the Centennial QSO Party and W1AW activations already have proven to be the largest and most active special events in the history of Amateur Radio, with more than 20,000 participants on the air from all continents." The event is considered an activity day, not a contest, and operation is permitted on all bands. Participants can call "CQ ARRL Centennial QSO Party" on phone or "CQ CENT" on CW or digital modes. While the event will focus on encouraging ARRL Red Badgers to hand out Centennial QSO Party points, all activity is welcome, regardless of point value. ARRL members are worth at least one point in the Centennial QSO Party. Participants get credit for each band/mode contact, regardless of point value. ARRL Centennial QSO Party participants can use the leader board to determine how many points they have accumulated. Other high-value contacts include: President Emeritus (PE) or Past President (PP), 275 points; Honorary Vice President (HVP) or ARRL Vice President (VP), 250 points; Director (DIR), Director Emeritus (DE), or Past Vice President (PVP), 225 points; Vice Director (VD), 200 points; Section Manager (SM), 175 points; ARRL officer (OFF) or Past Director (PD), 150 points, and Past Vice Director (PV), 125 points. W100AW, Charter Life Member (CLM), or Past Section Manager (PSM) contacts are worth 100 points. ARRL Headquarters department managers (DM), 75 points; ARRL Headquarters staffers/volunteers, (HQ), 50 points; Assistant Director (AD), 40 points, and NCJ Editor and QST columnists, 30 points. According to a news report, the Japan Aerospace Exploration Agency (JAXA) Hayabusa 2 asteroid mission, now scheduled to launch in December, will carry the Shin'en 2 (Abyss 2) Amateur Radio satellite. A 17 kg, 50 cm diameter polyhedron, Shin'en 2, built by students at Kyushu Inistitute of Technology, makes extensive use of carbon-fiber reinforced plastic materials that can be bonded by heat to reduce its weight and the number of hardware fasteners. In addition to a Mode J linear transponder for Amateur Radio communication, Shin'en 2 will include CW and WSJT beacons. The inclusion of the transponder will offer an opportunity for earthbound radio amateurs to test the limits of their communication capabilities. The Abyss 2/Shin'en 2 satellite is prepared for its journey into deep space. "For confirming the operational status of the spacecraft in deep space, the know-how of the Moon-reflecting communication technology can be applied. By using an Amateur Radio service transponder, amateur stations can communicate with each other when the spacecraft is in near-Moon orbit," a project outline on the Shin'en 2 website explains. "Beyond this distance, signal detection by Morse code and telemetry data transmitted from the spacecraft will be performed." The project is expected to help pave the way for future lunar rover missions. Hayabusa 2 will make a round trip to the C-type asteroid 1999 JU3, arriving at the asteroid in mid-2018. It then would survey and take samples of the asteroid before departing in December 2019, and return to Earth in December 2020. Shin'en 2 will be placed into an elliptical orbit around the Sun and travel into a deep space between Venus and Mars. Its inclination will be almost zero, which means Shin-En2 will stay in the Earth's equatorial plane. The distance from the Sun will be between 0.7 and 1.3 AU (an astronomical unit is 149,597,871 km). The ARTSAT2 "deep space sculpture" will travel into space. The IARU-coordinated frequencies for Shin'en 2 are: CW beacon, 437.505 MHz; WSJT telemetry, 437.385 MHz; Inverting SSB/CW transponder, 145.940-145.960 MHz uplink (LSB)/435.280-435.260 MHz downlink (USB). The project also is hoping to gather listener reports. "Mr Engle was warned repeatedly in writing by the Enforcement Bureau that his actions violated the law, and his apparent disregard for the Commission's authority warrants an increased penalty," the FCC said in the NAL. The FCC said that last October 23, agents from the Commission's Philadelphia office, responding to a complaint from a CB operator on 27.325 MHz, CB channel 32, tracked the interfering transmissions to Engle's station and "heard him repeatedly interrupt ongoing transmissions of another CB operator." The following day, the agents inspected Engle's CB station and discovered two linear RF amplifiers. The FCC said Engle "admitted that he used one of the power amplifiers" the previous night. Testing showed the unit was capable of putting out nearly 150 W.
The FCC pointed out that while its Part 95 rules do not require individual CB operators to obtain licenses, CBers who operate "in a manner that is inconsistent with the CB rules" are required to have an FCC authorization. "The Commission will presume an individual has used a linear or other external RF power amplifier, if the amplifier is located on the individual's premises," the NAL said, "and if there is other evidence showing that a CB station was operated with more power than allowed by the Rules." FCC rules also prohibit using an external RF amplifier with a FCC-certificated CB transmitter. "The fact that Mr. Engle operated with a linear amplifier to cause intentional interference to other CB operators despite being warned twice in writing demonstrates a deliberate disregard for the Commission's requirements and authority," the FCC, in making an "upward adjustment" of $5,000 in the proposed forfeiture. The ARRL Centennial W1AW portable operations taking place throughout 2014 from each of the 50 states are now in Tennessee and Oregon. They will relocate at 0000 UTC on Wednesday, September 10 (the evening of September 9 in US time zones), to Colorado (W1AW/0), New Hampshire (W1AW/1), and Texas (W1AW/5). During 2014 W1AW will be on the air from every state (at least twice) and most US territories, and it will be easy to work all states solely by contacting W1AW portable operations. A new take on training and a growing role in global disaster relief were primary discussion topics at the Army Military Auxiliary Radio System (MARS) leaders' workshop August 24-26 in Arizona. Behind the official agenda, however, loomed an understated theme: MARS is seeking younger tech-oriented hams -- or potential hams -- and recently retired members of the military to join its corps of seasoned volunteer communicators. Army MARS Headquarters introduced a new national staff officer from the business world to head up that effort -- Kurt Edelman, KF7PDV, of Willcox, Arizona, who holds the title of planning officer. "We discussed difficult issues, explored new ideas, and shared our successes and shortcomings," Army MARS Program Officer Paul English, WD8DBY, said in summarizing the meeting. "At the end of the day we are stronger and more cohesive than ever." 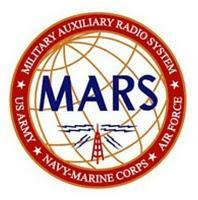 An official auxiliary within the US Department of Defense, MARS is formed of Amateur Radio operators who volunteer their time and equipment to support emergency communication in the event the Internet and telephone services are disrupted by natural or manmade disaster. The Army, Navy, and Air Force each have branches. During the August gathering at Army MARS Headquarters station in Fort Huachuca, Arizona, 11 region directors plus national staff officers discussed an innovative instructional methodology, debated eliminating membership qualifications based solely on hours on the air, and pondered marking the auxiliary's 90th anniversary next year with a vigorous recruiting drive. Kurt Edelman, KF7PDV, the new Planning Officer at Army MARS Headquarters, introduced himself and a new training system at the August MARS leadership workshop. It wasn't all policy and planning, though. Juanita Portz, the senior contract operator, guided attendees through the battery of military-standard transceivers that continuously monitor MARS and regular Army frequencies for contingency traffic. The leaders checked into an Arizona net and got familiar with military radio models that may turn up on MARS nets down the road. Edelman briefed leaders on an advanced instructional system that MARS now is eyeing as a possible replacement for current training and participation requirements. Known in the active Army as METL (for Mission-based Essential Task Lists), it replaces traditional generalized basic training with instruction in the specific tasks associated with an individual's duty assignment, and only those. METL could require annual qualification in tasks rather than simply requiring personnel to accumulate a minimum number of hours served. A former vice president in charge of new technology at a Fortune 500 financial firm, Edelman leads a workgroup of region directors and trainers drafting a preliminary METL program, which he expects to deliver as early as 2015. Wrapping up the meeting was preliminary discussion on commemorating the 90th anniversary of the Army's invitation to the ARRL to partner in disaster communication. Although hams had collaborated with the Army and Navy during World War I, the Army-Amateur Radio System, launched in August 1925, was the first permanent amateur-government accord in the US. It became Army MARS after World War II, and independent Air Force and Navy-Marine Corps branches soon followed. Read more. The ARRL September VHF Contest provides a chance for radio amateurs at all levels to experience contesting on the most popular VHF and UHF bands as well as those less-frequented frequencies above 450 MHz. The higher you go, the greater the point value of your contacts! The contest gets underway on September 13 at 1800 UTC and wraps up on September 15 at 0259 UTC. Newcomers and veteran amateurs will be attempting to work as many 2 × 1 grid squares as possible on frequencies above 50 MHz from home stations, from the field, or from "rovers" that travel from grid square to grid square. With a heightened potential for tropospheric conditions, the September VHF Contest offers something that VHF contests at other times of the year often cannot. 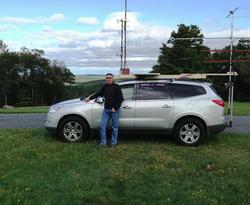 K2QOR was among the rovers on the air in New England for the September 2013 VHF Contest. New categories -- Single Operator, 3 Band, and Single Operator, FM Only -- have been added to allow stations with limited equipment to get in on the fun. With just a hand-held transceiver and Yagi, a single operator can take to the air and compete against other stations with similar equipment. Utilizing frequencies that require smaller, lightweight antennas provides an excellent opportunity for homebrewing and finding a favorite hilltop operating location. Six meters is probably the most popular band for this event, since many newer HF transceivers include 6 meters. Most SSB activity on 6 meters will take place between 50.125 MHz and 50.250MHz, and CW between 50.080 MHz and 50.100 MHz. The frequencies between 50.100 MHz and 50.125 MHz are considered a "DX window" for contacts between US/Canada and DX stations, so avoid US-to-US contacts in that part of the band. Activity centers for SSB activity are 50.125, 144.200, 222.100, and 432.100 MHz. These are calling frequencies, however, and contest participants should avoid monopolizing them. Those operating FM on 2 meters are reminded that the ARRL General VHF Contest Rules prohibit contest operators from using the national simplex frequency of 146.52 MHz to make or solicit contacts. Check the band plans for details on all bands. Rules and entry forms are on the ARRL website. All logs must be e-mailed or postmarked no later than 0300 UTC on October 16, 2014. Electronic logs are preferred. Send paper logs to September VHF Contest, ARRL, 225 Main St, Newington, CT 06111. For more information about the ARRL September VHF Contest, e-mail the Contest Branch. 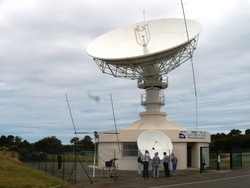 The site of the gigantic antenna in France that received the first live TV broadcast from the US via the Telstar satellite served as the backdrop August 25-26, as more than 100 moonbounce (EME) enthusiasts from 18 countries gathered to compare notes and to socialize. The 16th International EME Conference was held at the Parc du Radôme in Northern Brittany. In July 1962, the 64 meter Radôme was on the receiving end of the first TV satellite link between the US and Europe. Those attending EME 2014 engage in similar activity, bouncing their Amateur Radio signals from Earth to the Moon and back, operating on frequencies as high as 77 GHz. 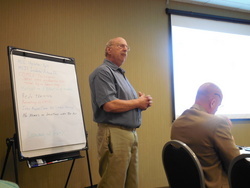 The conference featured some 2 dozen presentations on moonbounce-related topics. EME and 5.6 GHz CW/SSB EME stations, and reception of the 10 GHz EME beacon with a small 50 cm dish, preamp and down-converter." Rosen said attendees also exchanged technical small talk throughout the 2-day event. Rosen said a presentation by Al Katz, K2UYH, addressed the important issue of Doppler shift in EME work. "Although Doppler shift for EME signals is almost negligible on 6 and 2 meters, it becomes a bigger challenge as the frequencies used are increased. As there are many stations using 432 MHz and bands through 24 GHz to communicate by the moon, Doppler shift becomes trickier to calculate," Rosen said in recounting Katz's talk. "Doppler shift at 10 GHz can be several kilohertz. The Earth is continually spinning and the apparent position of the moon is changing at rates that may differ for both the transmitting and receiving stations. The ability to listen to one's own echoes or to place a signal where it will likely to be heard by a DX station is critical to the success of an EME QSO." "Al walked us through the various situations, use of Doppler prediction software and helped clarify to many of us the use of these tools," Rosen said. A presentation by Jan van Muijlwijk, PA3FXB, outlined the history and restoration of the 25-meter diameter Dwingeloo dish, which has been operational as a radio astronomy site since 1956 but sat dormant since the 1990s. As van Muijlwijk's presentation explained, volunteers restored the facility during a 2-year publicly funded project that involved disassembling and refurbishing the dish. Restoring the reassembled dish to its mount involved the largest crane in The Netherlands. The PI9CAM station at Dwingeloo is now active on the air on 432 MHz and 1296 MHz moonbounce. "The station also was used to help an ailing nanosatellite last fall," Rosen explained. "[T]he satellite became unresponsive to commands due to a spurious 2 meter output that was blocking the 432 MHz command receiver. Once software was loaded at Dwingeloo, a set of commands were sent to shut off the 2 meter transmitter, and the satellite was successfully restored to operation." Rosen said the PI9CAM station is one of the easiest to work, by even modest EME stations. The Dwingeloo dish has even served as a wedding venue. 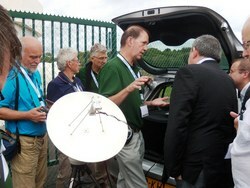 Hans van Alphen, PA0EHG, described and demonstrated a small-dish EME 10 GHz beacon receiver. The DL0SHF 10 GHz beacon was placed on the air using a 7.6-meter dish and 50 W output in December 2013. Using a compact motorized auto-tracking system and a 48 cm dish, van Alphen was able to copy the beacon in both its high (600 W) and low (50 W) power outputs, Rosen said. The World Wide Radio Operators Foundation (WWROF) will sponsor a Top Band webinar, "A Long Overdue Review of Gray Line Propagation on the Low Bands," for Thursday, September 11, at 9 PM EDT (Friday, September 12 at 0100 UTC). The online industry publication SatelliteToday has reported that the UKube-1 CubeSat is "experiencing an anomaly with its primary communications link." To work around the problem, the United Kingdom Space Agency (UKSA) commanded the small spacecraft to use an alternate configuration of what it called "the FUNcube-2 transceiver," using it as the satellite's temporary downlink. The Amateur Radio transponder on FUNcube-2 is not yet active -- just the BPSK telemetry beacon on 145.915 MHz. UKube-1 is hosting FUNcube-2, which is actually a set of FUNcube boards flying as a sub-system of the 3U CubeSat. The FUNcube project is aimed at supporting science, technology, engineering, and mathematics (STEM) initiatives now underway in the US, the UK, and elsewhere. The target audience is primary and secondary school students. According to SatelliteToday, the satellite, which launched on July 8, is otherwise healthy and its attitude is stable, but the communication "anomaly" is not allowing ground controllers to proceed with normal payload commissioning. 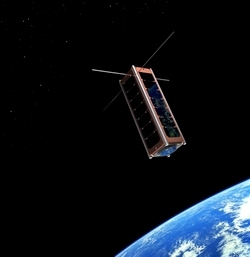 UKube-1 is the space agency's first CubeSat. The USKA said the FUNcube-2 payload is running at high power to make it easier for schools to copy its telemetry. 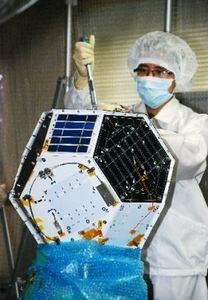 SatelliteToday said the space agency hopes to stabilize UKube-1 over the coming weeks to permit payload commissioning. The FUNcube-2 payload includes a 400 mW inverting SSB/CW Amateur Radio transponder, with an uplink passband of 435.080 to 435.060 MHz (LSB) and a downlink passband of 145.930-145.950 MHz (USB). The telemetry beacon is on 145.915 MHz. The 10th annual W4DXCC DX and Contest Convention takes place September 26-27 in Pigeon Forge, Tennessee. This year's event features extended hours and a full schedule of forum presenters. Among presentations on the program is "FT5ZM, to the End of the World and Back" with Bob Allphin, K4UEE. Also, Krish Kanakasapapathi, W4VKU, will discuss the VU7AG DXpedition. Stan Goldberg, the artist who, with Mike Esposito, drew the "Archie's Ham Radio Adventure" comic for ARRL in the 1990s, died August 31. He was 82. 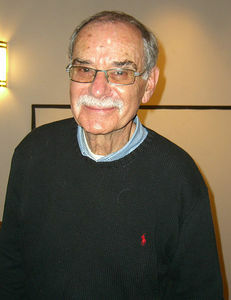 A New York City native, Goldberg was Marvel Comics' chief colorist during the 1960s, when most of the characters now associated with Marvel were created. "He's the reason Spider Man's costume is red and dark blue, the reason the Incredible Hulk's skin is green," said Jim Massara, N2EST, who penned QST cartoons in the 1980s and also once worked for Marvel. "Goldberg was a giant in our industry." Massara said Goldberg was best known for drawing teen-related comics, first for Timely, a Marvel Comics predecessor, where Goldberg started as a staff colorist in 1949, when he was just 16. He went on to work for DC Comics and, finally, for Archie Comics starting in the early 1970s. "He was Archie Comics' prolific lead artist for a number of years, and along with Dan DeCarlo was one of two artists who defined the look of Archie and the gang for several decades," Massara told ARRL. Massara said Goldberg was well liked and respected by his colleagues. In 1994, he was honored with an Inkpot Award at Comic-Con International in San Diego, and in 2012 he was inducted into the National Cartoonist Society's Hall of Fame. 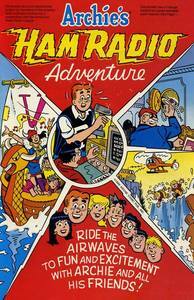 The ARRL and members of the Amateur Radio business community cooperated to develop the "Archie's Ham Radio Adventure" comic. Among his regrets, Massara said, is that he never got to meet Goldberg, who was working as a freelancer while he worked for Marvel as an assistant editor. "Goldberg was on my extremely short list of old pros I eventually wanted to meet and thank for their influence," Massara said. "Even though he and his wife had been in a severe car accident recently, I had heard they were both on the mend, and I had no reason to believe his passing was imminent. I'd never heard anything about Goldberg other than what a gentleman and professional he was. I'm sorry I never got to meet him." Goldberg had suffered a debilitating stroke in mid-August. His Facebook page includes more information on his work. The September 1976 issue of QST announced that Al, K2UYH, had succeeded at Worked All Continents (WAC) on 432 MHz -- via moonbounce! Amateur Radio was well represented at the 1976 grand opening of the Smithsonian National Air and Space Museum. A backup OSCAR 1 satellite -- the world's first non-government satellite -- was on display, and a battery-powered station was set up to make contacts via OSCARs 6 and 7. After 12 years in pursuit of 2 meter Worked All States (WAS) using meteor scatter, auroral, tropospheric, and moonbounce propagation, K0MQS finally turned the trick in early 1976! Showing that there are always new adventures in ham radio, W9JA in 1976 earned a 5-band WAS for working only hams with 1 × 2 call signs! By 1977, plans had begun for the Phase III Amateur Radio satellite, which would be far more sophisticated and capable than any AMSAT "birds" to date. Articles began appearing in QST in the late 1970s that reported on hams building alternative power systems using solar and wind power. During the late 1970s, more and more 2 meter repeaters were put on the air, mostly by ham clubs. Sorting out new rules and regulations for them turned into a major undertaking for the FCC, including dealing with phone patches and autopatches via repeaters. QST responded with articles and notes to report the rules changes. On March 20, 1978, the FCC banned 10 meter amplifiers, because of the large-scale misuse of them on Citizens Band. This happened, despite the efforts of ARRL and many individual hams and ham clubs to leave the hams alone and to go after errant CBers instead. A guest editorial by Dave Bell, W6AQ, in the May 1978 QST is a splendid fable mirroring the FCC decision. By the late 1970s, attention began to be focused on the potential dangers to hams of RF radiation. A QST article in September 1978 described the experiences of Naomi Uemura, JG1QFW, as the first solo explorer to reach the North Pole. Hams set up an emergency circuit for his support, and tracked his dog sledge via reports relayed through the Nimbus 6 satellite. During the late 1970s, considerable attention was given to the new concept of narrowband voice modulation (NBVM). The new technique of frequency-compressed SSB was reported in the December 1977 QST, and the editorial in the September 1978 issue announced that W1AW would soon begin test transmissions, together with instructions as to how the signal can be tuned in (with reduced intelligibility) using normal SSB receivers. NBVM never caught on, however. Tad Cook, K7RA, Seattle, Washington, reports: Sunspot activity continued to weaken over the past 7 days (August 28 through September 3). Average daily sunspot numbers declined from 113.4 to 85.1, and average daily solar flux dropped from 130.5 to 126.7. Geomagnetic activity was up recently, with the average planetary A index increasing from 7.4 to 14.7 -- nearly double the values recorded a week earlier. The latest predicted solar flux values are 140 on September 4, 135 on September 5-6, 130 on September 7-8, 120 on September 9-10, 115 on September 11-13, and 110 on September 14-15. Values rise again, reaching a very modest peak of 135 on September 20-21, just before the fall equinox on September 23. The predicted planetary A index is 8, 10, 20, and 15 on September 4-7, 8 on September 8-9, 5 on September 10-12, 8 on September 13, and 5 on September 14-24. One encouraging sign: The GOES-15 X-Ray background flux has risen over the past few days. It was C1.2 and C1.0 on September 2-3, and it hasn't had a C reading in quite some time. This is actually more significant than solar flux with respect to its effect on the ionosphere. 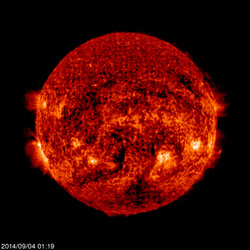 You can check the background flux daily on NOAA's Space Weather Prediction Center website. If you take a look at the quarterly record, you can see that X-Ray background flux has not been this high since early July. In Friday's bulletin look for an updated forecast and reports from readers, plus the monthly update to our 3-month moving average of daily sunspot numbers. September 6 -- DARC 10 Meter Digital "Corona"